Joyce Glasser reviews Final Portrait (August 18, 2017) (Cert. 15), 90 min. In his mammoth biography of the Swiss sculptor and painter Alberto Giacometti, the American writer James Lord wrote that Giacometti was “the one person encountered in my entire lifetime for whom I could feel unequivocal admiration”. Lord, who died in Paris in 2009, aged 87, knew a lot of famous and accomplished people, too. Viewers of Stanley Tucci’s fifth film as writer/director, Final Portrait , might not reach that conclusion. While Geoffrey Rush gives a convincing portrayal of the artist as a frenetic, obsessive and moody genius, the film never goes anywhere. If you have not seen Giacometti’s work, you might leave the cinema wondering why we should care about him, his final portrait, or the sitter, of whom we learn almost nothing. This then is the plot – a kind of snail’s pace race against the clock – of Tucci’s biopic which, in current fashion, dramatises a segment of a person’s life to stand in for the whole. In Giacometti’s case, this is the right approach because his vocation was one long struggle to capture the essence of the person before him before it disappeared, which it inevitably did. Those who saw the recent retrospective at the Tate Modern will realise that the artist is more famous for his magnificent, unique sculptures, but, as the exhibition shows, from the 1950s onwards, everyone wanted to sit for a portrait. Giacometti thought that once he succeeded in capturing the eyes, he could move on to landscapes and still lives – but he never did. In the film we watch the revered artist do – and undo – a portrait of Lord. In between, we meet the artist’s model/assistant (and artist) brother Diego (Tony Shalhoub, humorous) and Giacometti’s long suffering wife and model of twenty years Annette Arm (Sylvie Testud), whom he married when he was 45. We also meet his tempestuous, much younger mistress/model, Caroline (Clémence Poésy). Either Caroline was the most annoying, loud, self-absorbed woman in Paris or Poésy is seriously hamming it up. Caroline has been described as funny and fun to be but none of that comes across. Poor Giacometti does not come out of this looking good. There is nothing inherently dramatic about an artist painting a model. Tucci tries to spice things up with Giacometti’s wit and exclamations of merde!, but he fails miserably to bring alive the artist/model relationship (they had known one another for over ten years), Lord’s intelligence and personality or the artist’s intellect. Lord wrote a fascinating memoir about his experience posing. ‘Portrait of Giacometti’ is rich in entertaining anecdotes. Very few make it into the film. The artist did say ‘merde!’ a lot, get drunk with Caroline and impulsively walk out of the studio for a coffee as in the film, but he also spoke elegantly and beautifully about art – and not just his. He shares with Lord his fascinating insights into the paintings he saw at the National gallery during a trip to London where he met up with Francis Bacon. 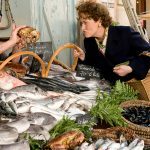 Tucci, whose love of Paris and haute cuisine shown through his warm portrayal of Julia Child’s husband in Julie & Julia (2009), turns a soundstage in Twickenham – and a few locations in London – into Giacometti’s Paris. He captures the artist consuming his regular late lunch, accompanied by two glasses of wine and two cups of coffee. His studio of 40 years at 46 rue Hippolyte-Maindron has been reproduced right down to the carefully deployed dust and clutter. As we see in the film, Giacometti’s self-flagellation and perceived inadequacies do not affect the prices that his work was fetching. There is a scene in which he brings a thick wad of cash to a café where Caroline’s gangster pimps expect a harder bargain. Caroline was, for four years, his aphrodisiac and he needs her to work. Meanwhile, back at home, Annette is freezing in the cold studio-house and pleading for a new dress to wear to the opera. (Giacometti makes a disparaging remark about Chagall’s stained glass dome in the opera house and calls Picasso a thief). 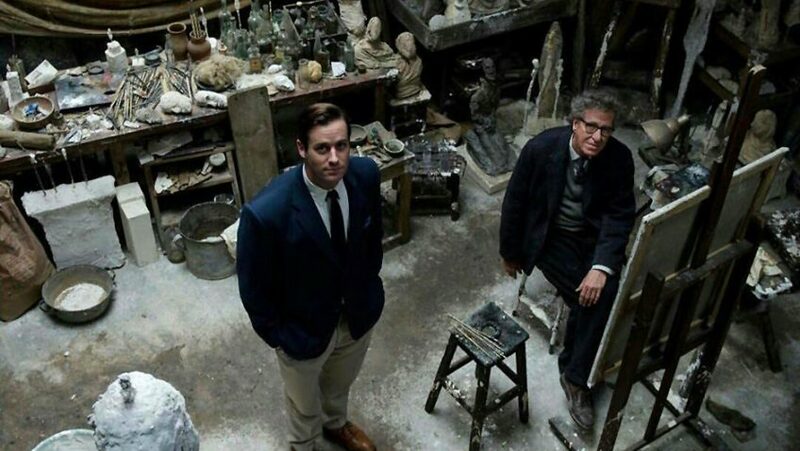 Final Portrait conveys Giacometti’s conviction that ‘the more one works on a picture, the more impossible it becomes to finish it’ to a tiresome level, but there is no narrative progression. If we do not expect character development here, but there is no emotional, philosophical or intellectual journey either. Nor is the scene in which we see the final portrait the sublime climax that it should be. The famous painting, which sold at Christie’s for nearly $21 million, is mesmerising. Against a very dark background, Lord’s eyes flash out with that ‘penetrating gaze’ that Giacometti found so elusive. It is both the portrait of a seated Egyptian god – only with his powerful legs wide apart – and of the ‘thug’ that Giacometti saw in Lord’s American head, and solid build.